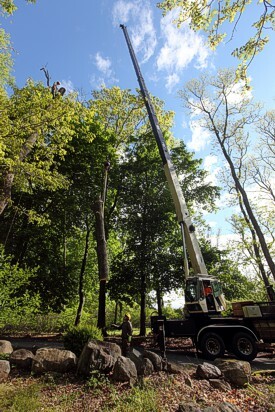 Landscape trees require a level of care to maintain the structural integrity and aesthetics. Pruning can be used to address the follow issues: removal of dead branches, to improve form and reduce risk, to increase light and air penetration to the inside of the crown or landscape below and sometimes as corrective or preventative measures. Class I Pruning - also referred to as fine pruning is always recommended for premium quality work with a focus on safety, health of the tree, aesthetic considerations and structural integrity. This includes the removal of deadwood down to 1/2" in diameter and is the most through trimming offered. Class II Pruning - also referred to as standard pruning is recommended for general tree maintenance and includes the removal of deadwood down to 1" in diameter. Class III Pruning - is specifically set aside for hazard pruning and is recommended when safety considerations are the most important. Class IV Pruning - also referred to as crown reduction is recommended when the top or sides of individual limbs must be reduced in size and spread or the parent limb or dominant leader is removed. This is usually done after significant damage has affected the crown. *Topping is not a form of crown reduction and is never recommended for any reason. Is a physical support for weak branches and stems to increase strength and stability, however such supports are not guarantees against failure. After installation maintenance of these devices must occur on a regular basis to help ensure the health and wellbeing of both the tree and the equipment. Some trees with an unacceptable level of risk must be removed. This is achieved by systematically removing limbs from trunk in a safe and orderly fashion. After a removal the stump is ground down several inches below ground level with debris removed once desired depth is achieved. Crane assistance when environment proves to be too dangerous to attempt unaided. Emergency services for storm damage or unforeseen damage.